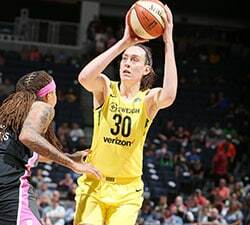 When the final buzzer sounded and the Seattle Storm were officially the 2018 WNBA champions, there was an embrace on the court by Sue Bird and Breanna Stewart. 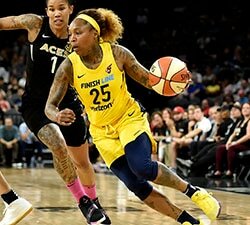 The 37-year-old veteran point guard won her third WNBA title and first in eight years with a young squad led by the 24-year-old Most Valuable Player. Cameras captured the moment that will serve as a touch point when people look back on this Storm playoff run. But it will not tell the complete story of this series or this season from the Seattle Storm. Yes, Stewart was named Finals MVP after dropping a game-high 30 points in the series-clinching Game 3 win. And Bird finished with a double-double with 10 points and 10 dimes on Wednesday as she orchestrated the Storm offense brilliantly throughout the series. But anyone that watched Game 3 will not soon forget the performance from Natasha Howard, who scored a career-best 29 points on 11-for-14 shooting to go with 14 rebounds, three assists and two blocks. She picked a pretty good night to have the best game of her WNBA career. Howard averaged an impressive double-double for the series – 18.7 points and 10.7 rebounds – as she became the third player in WNBA history to win back-to-back playoffs with two different teams. 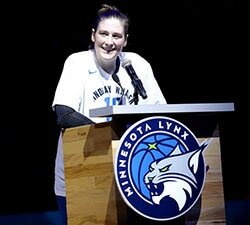 Howard was playing in her fourth consecutive WNBA Finals – 2015 with Indiana, 2016 and 2017 with Minnesota before this season – but was a role player off the bench for all of those teams. With the Storm, Howard has been able to showcase all of her talents on the brightest stage.
.@nhoward1033 had a DOMINANT Game 3, finishing with 29 PTS & 14 REB as @seattlestorm clinched the title! In addition to her scoring and rebounding, Howard was also the primary defender on Mystics star forward Elena Delle Donne. Howard’s ability to frustrate Delle Donne and defend her one-on-one so the Storm didn’t always have to send a double-team was impressive despite Delle Donne’s limitations due to her knee injury. “Having Natasha was probably the biggest thing that we could have done this season was getting her,” said Stewart. “Just the fact that she’s so versatile and I don’t think she’s as respected as she should be as far as what she can do on the court. 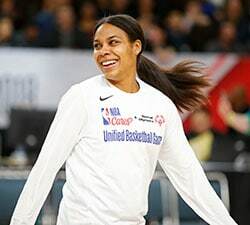 Another often-overlooked player that shined on both ends of the court for Seattle was Clark, the seventh-year pro that took on the task of being the primary defender on Washington’s other All-Star – Kristi Toliver – throughout the series. Clark’s combination of size (four-inch height advantage and longer wingspan) and quickness (able to move laterally to keep Toliver in front of her) made life difficult for Toliver all Finals long. Clark best summed up Seattle’s philosophy following the game, saying that nobody on the team cared about getting the credit as long as the team won. “Alysha Clark to me embodied Seattle basketball,” said Storm coach Dan Hughes. “The way she guarded, the way she went to the boards, the relentless nature with an intelligence about her. Amazing. “And Sami Whitcomb. Sami Whitcomb battles, battled, battled, moved up the ladder in the Playoffs, and really, really impacted this basketball team in a big way. While Stewart and Bird will garner most of the headlines and dominate the highlight reels, the two All-Stars know that they could not have achieved their goal without the contributions that came from up and down the Storm roster this season. Whitcomb didn’t play in Seattle’s first two games against Phoenix in the semifinals and averaged just 12.7 minutes off the bench in the Finals. But when her number was called, she was ready to shoot and contribute in any way she could. She scored 18 points in her 38 total minutes in the Finals, knocking down six 3-pointers on offense and coming up with four steals on defense. In the end, Seattle’s collection of talent was too much for Washington to overcome. The question is, will any team have an answer when the Storm begin their title defense in 2019?